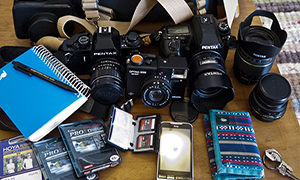 Todays bag has not only a couple of cool cameras, but a pretty cool little box of tricks too. 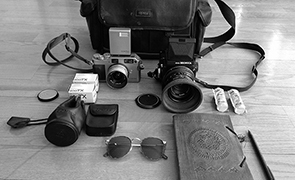 Come and check out Dmitri’s bag to see what I mean. I’m an avid reader of the Japan Camera Hunter blog, and I think I’ve been through pretty much all In My Bag posts. 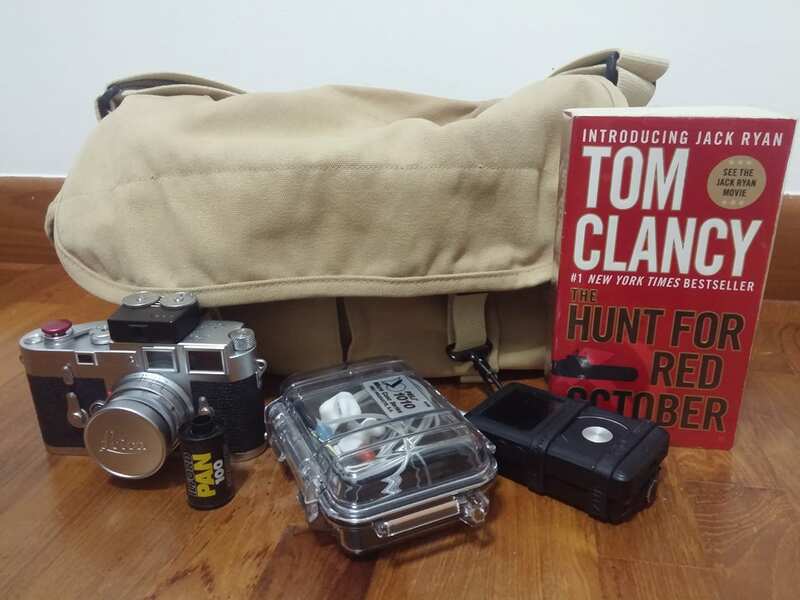 After having been peeking into others bags for quite a while, I thought I’d share my bag with your readers. First the bag. 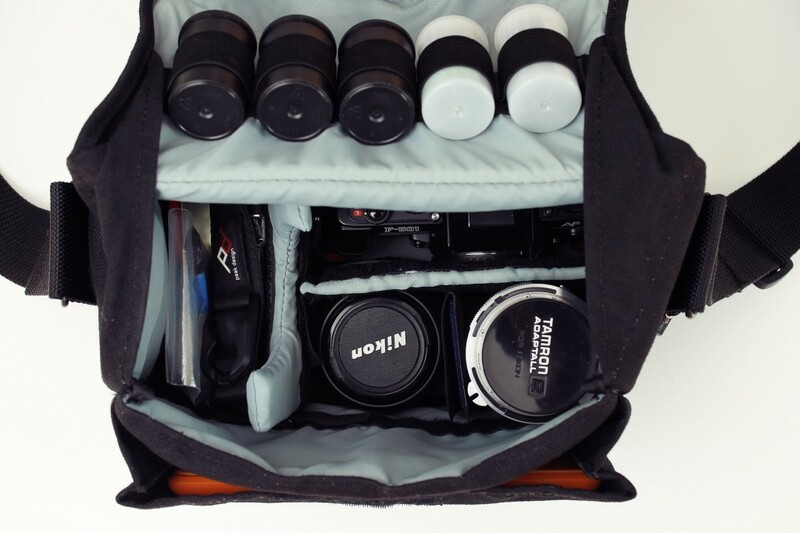 It’s a vintage Tenba film bag (with dedicated holders for film canisters). The previous owner didn’t treat it very well: when I got it, the bag was pretty dirty and full of cat hairs (yuck!). But after a long wash in the washing machine and some TLC, it looks like new. I like this bag because it feels solid and spacious despite its size. My film camera of choice is a Nikon F-501 with MF-19 databack. 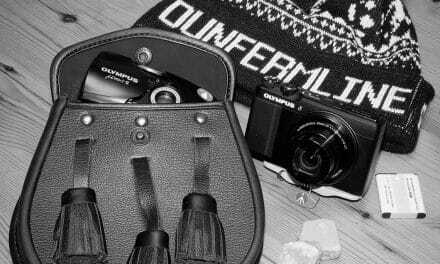 This camera doesn’t enjoy a cult following, so it’s not very expensive. It was the first Nikon SLR with auto-focus, it’s solidly built and just works. I don’t use the databack much, but all these buttons add some geeky chic to the camera. I use Peak Design’s Cuff (https://peakdesignltd.com/leash-cuff/) to carry the camera (black strip to the left of the camera). I shoot mainly with Ilford XP2 Super 400 film (three black canisters above the camera). The last remaining lab in our town offers only C41 development, so I have to use chromogenic film, unless I want to wait two weeks or longer for a regular B&W film to be processed in Germany. Actually, I love this film, and ISO 400 is perfect for the gloomy Danish weather. I usually carry a couple of Fujifilm color film for good measure. 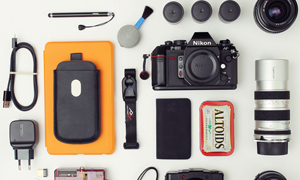 You may notice an Altoids tin right under the Nikon F-501. This is my mini travel kit containing the following items: a mini Maglite flashlight with a spare AAA battery, a 16GB USB stick, a couple of plasters, pain killer pills, a tiny plastic fork, and two cotton pads. It’s amazing how much you can fit into an Altoids tin! Next to the tin is a microfiber cloth, handy for wiping the gear. I also use a small blower/brush combo as a cleaning tool. I usually pack two lenses: a Nikkor 35-70mm f/3.3-4.5 kit lens, and a Tamron 70-150mm f/3.8 Adaptall lens. I have a soft spot for Tamrom Adaptall and Adaptall 2 lenses, and I use them with my DSLRs as well. The third lens, Tamron 28mm f/2.8 Adaptall, is a relatively recent addition, and I actually haven’t had a chance to try it. My backup camera is an Olympus XA2. I love its slick capsule design and diminutive size. I usually carry it in my pocket. I pack some computer gear, too, including a Google Nexus 7 Android tablet (bright orange thingy to the left) and Samsung Galaxy S III Android smartphone. I use the latter a lot for taking snapshots. Now, can you guess what this small plastic box below the tablet is? It’s a Raspberry Pi single-board computer, which I always have with me along with an SD card and a USB Wi-Fi adapter. When I’m not writing articles, I blog about open source photography tools and my photographic endeavors on my Scribbles and Snaps blog (https://scribblesandsnaps.wordpress.com). You can find a hand-picked selection of my photos at http://dmpop.dyndns.org/pygmyfoto/. The gallery is powered by an application cobbled together by yours truly and running on Raspberry Pi at my home. You can also find me on Google+ (https://plus.google.com/u/0/113174485241075479693/posts). Thanks for sharing your cool bagshot and your funky little box of computery tricks with us. It is cool to see a 501 getting some miles too. Very good team. I am in favor of simplicity bags to make it easier to take pictures. Thanks also to let me know your computer RASPBERRY PI. It was a discovery for me seems a world of possibilities. Excuse my English I’m studying is Google! good day mate! I am really interested to know why you need a fork with you :). 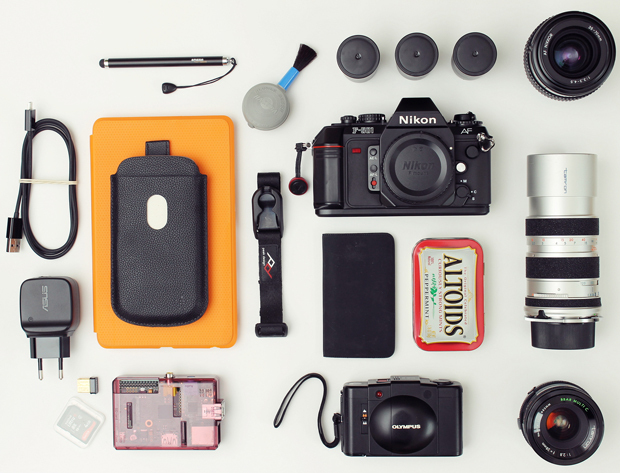 I dig the photo of your stuff, clean and well laid out! This tickles even more. I would never have thought of using a fork to fill up space…. :) Good humour!